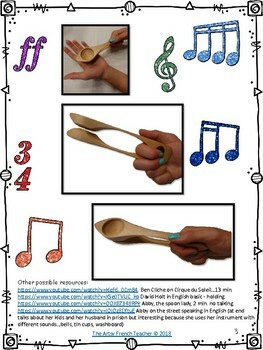 This resource enables the Music teacher to teach 6 basic methods/techniques of spoon playing and to also incorporate Ontario music expectations since the students create their own routine to accompany a (French) song. 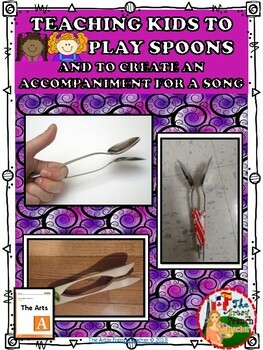 TEACHING KIDS TO PLAY SPOONS And To Create An Accompaniment For A Song simplifies the task of teaching the “creative process” of music (page 21, 22 of The Ontario Arts Curriculum) and adds a lot of engaging, rewarding hands-on learning in your classroom! 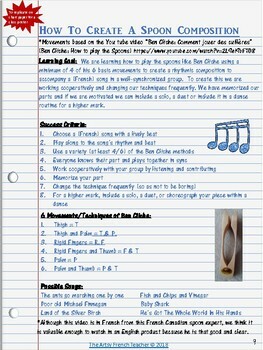 Piloted with grades 3-6 but could apply to grades 7 & 8 as well.